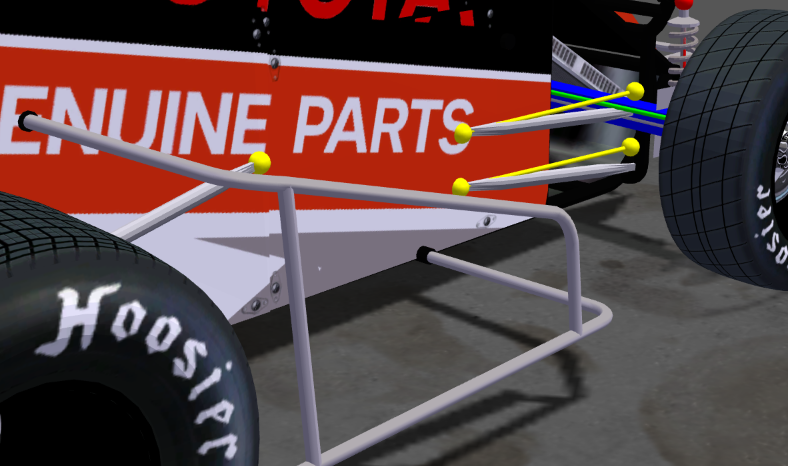 I set all the pos and axle values to 0 for my car and on the spinner the radius rods line up in the right location on the car, but a little low at the axle. On track they wildy spin around the car, with no apparent rhyme or reason. Where do I align the pivot on the radius rod in my 3d editor? On the spinner it doesn't appear to matter. What are the numbers in for pos and axle in the gfx.CFG defining? I am working off of the wingless sprint car as my car is just a smaller version of it. Stands no taller than 4'10", it just may be Aussie . Anything at all you can offer? I'd really like to get these radius rods properly animated. This is were a in game tool would help. What's it doing on track? They're spinning around the center axis point of the car instead of staying static at their locations on the model, Aussie. Are they their own models? For the love of God. Please. What are these points? I hope the growing team means that good things are happening for PiBoSo.